There are several large seafood restaurants just south of the pier on Naresdamri Road, each offering beautiful views of the boats coming and going from the dock. These restaurants include the Meekaruna, the Chaolay, the Saeng Thai (I’m not sure if the Saeng Thai is still on the waterfront as they’ve opened a new site on Naepkhaehart Rd, an increasingly popular upscale stretch a little north and west of the waterfront) and the Cholern Pochana. 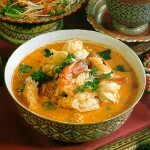 Their menus are quite extensive and offer Thai delights unavailable in the local Thai restaurant in your home city. Remember though, the treats here are probably a bit more spicy than the bland fare your local take-away offers. The key Thai phrase to remember for the faint of taste bud is My Phet–not too spicy! The best seafood in the area, to my mind, is not in Hua Hin but in nearby Cha Am. The Pak Klong is not known for its ambiance or view but often has a queue out into the street for it’s widely known for its delicious offerings and generous servings. The Pak Klong is at the northern end of the Cha Am beach, just past where the road veers inland. It’s a bit out of the way but all the locals know it so just ask if you think you’ve lost your way. Here is the location of one of the best kept secrets in Thailand. It’s well worth the drive and an ideal place to take a new-found Thai friend who can help you explore their varied menu. Don’t even think of visiting if you don’t try their Yam Gaeson Hoi (ยำเกสรหอย)–if it’s the first thing you order, they’ll know who sent you! Also, there are those among us who swear by Somboon’s crab curry in Bangkok. Somboon’s is probably OK for Bangkok, if you like eggs and soup. However, if you like chunks of crab meat as big as your thumb and a delicate curry, look no further than Pak Klong. Some folks just need to get out more. These restaurants are clustered on and around Petchkasem Road, between the night market and the Hua Hin temple. The menus are similar to those at the sea front places but the dishes tend to be a bit less spicy. The food is good however though the view might not be quite as romantic. Another very popular Chinese seafood restaurant is the Hi Bieng on Petchkasem Rd, at Soi 64. The Hi Bieng can be very quiet on most days but when the Bangkok hoards come down, it becomes a zoo. There can be as many as a dozen VIP coaches parked out front and a couple of hundred Bangkokians will walk en masse to fill up on Chinese seafood delights. It’s probably best to stay away on those days. The Night Market, on Dechanuchit Road, has everything from noodles, fried rice and oyster omelets to Dom Yom Gung (spicy lemon grass soup with shrimp) and grilled horseshoe crab. Closed to traffic in the evening, this street west of Petchkasem Rd comes alive with food stalls with folding tables serving all types of food, sweets and cold drinks and many stalls offering handicrafts, wood carvings, Thai CDs and tapes, and even magic tricks. A great place to practice your bargaining skills between breaks for a cold beer, snacks, and some serious people watching. There also several seafood restaurants at the night market, closer to the railway line end, which also serve steaks and chops. 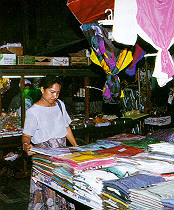 The Grand Market, next to the Grand Hotel a bit south at Soi 86, is a similar market, probably more popular with locals and residents. 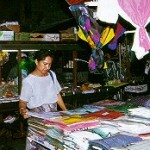 Many clothes, shoes, and odds and ends shops, and good local food at reasonable prices. There is another strip of small Thai restaurants on Phunsuk Rd behind Hua Hin temple which offer many local dishes. For some spicy Northeastern (Essan) Thai food like grilled chicken, sticky rice and Som Tom (raw papaya salad) this is the place to go. If you visit the Teak Palace at the Rama 6 Camp north of town, you should stop by either Saep Eli or Ban Essan. Saep Eli has been there for many years, across from the entrance to the Narasuan Camp, offering some of the best Essan food in the area. A few years ago, Ban Essan opened a couple of hundred meters south of Saep Eli and with just the overflow from the former would do a decent trade but they have developed their own clientage over the years which shows they can hold their own anyway. Either are worth visiting but both can be very busy between 1100 and 1400, especially on weekends. Sukhumvit has moved to Hua Hin. Big Macs are available across the street from Burger King and they’re both open 24 hours. McDonald’s has also opened in the Market Village Mall just south of the town center. Pizza Company has two locations, one across from the Night Market on Phetkasem and another in Market Village. In addition, there are two Starbucks and dozens of wannabees in town. two KFCs, Fuji, Sizzler, Sante Fe Steak, S&P, MK Suki, Subway, Häagen-Dazs, Dairy Queen, and probably more but I don’t get out as much as I used to. In Hua Hin, not just the pizza places deliver. There are no drive-thrus here but all the giants deliver and have hotline telephone numbers: Pizza Co & Burger King–1112 (Pizza Co and BK have the same number as Heinecke owns them both); KFC–1150; McDonald’s–1711. Most Thai restaurants and food stalls are more than willing to wrap up anything from noodles to fried or grilled chicken to banana fritters for a quick take-away and most folks here still drink pop out of a plastic bag handily wrapped with a rubber band–it’s cheaper and you don’t have to worry about what to do with the aluminum can. Expats from many nations have settled in Hua Hin and the large number of restaurants offering Western and other dishes reflect the diversity of this group. Even without the chains, Hua Hin offers some very good Italian, Indian, Muslim, Scandinavian, and Mexican food so one doesn’t have to eat rice every night. 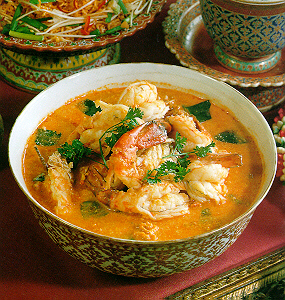 As in other areas of Thailand, Hua Hin also has many Muslim Restaurants, offering mainly dishes from southern Thailand. Though the name of the restaurant will probably be in Thai script, the signs usually feature a Star and Crescent signifying Muslim food. Martabak is also available in Hua Hin. Just down from the martabak shop, at the corner of Railway Rd. and Dechanuchit Rd. (Soi 72) is another Muslim Restaurant. Here is how you write Halal Food in Thai if this is a concern: อาหารฮาลาล. Lo Stivale, Italian Restaurant and Pizzeria. Good food with both an air-conditioned dining room and a terrace with a nice view of the folks walking the street. 132 Naresdamri Rd. Tel: (032) 513-800. The Taj Mahal, near the Chinese temple at the north end of the Hilton, has dishes from the sub-continent. As does Maharaja, a few doors down towards the fishing pier. La Villa Restaurant on Poolsuk Rd opposite the City Beach Hotel offers “the true taste of Italian food” and are known for their green lasagna. Tel: (032) 513-435. The Admiral Pub and Restaurant serves Scandinavian Style Traditional “SMØRREBRØD” and other Danish, International, and Thai food in a very lovely and airy setting. Located near the Post Office, The Admiral Pub is decorated in a “turn of the century atmospheres” inspired by the entrepreneurs and officers who came to Siam around the turn of last century. 19/6 Damnernkaseam Road. (032) 532-365. For those with a taste for Swiss food, Heidi’s Garden Restaurant serves Heidi’s Swiss Hits and Thai food in a garden atmosphere. Wienerschnitzel, Cordon bleu, and King Size Baguettes top her list of hits and prices are reasonable. Located on Poolsuk Rd, just north of the City Beach Hotel, Heidi’s can be reached at 032 532-367. The Sunshine Bakery and Restaurant serves many needs. Along with freshly baked bread and Hua Hin’s best croissants, Sunshine also hosts a delicatessen, Internet cafe, and one of the oldest Austrian/German restaurants in town. Directly across the Hilton on Naresdamri Road, Sunshine is reached via a little Soi. You’ll probably see the sign for the Internet cafe or get a peek of the bakery before you realize it’s also a restaurant. They offer Thai and International food and their schnitzel (said to be the best in Hua Hin) and sausages are praised. 130/5 Naresdamri Road. (032) 532-475. There are several restaurants in Hua Hin offering Swedish food. As far as I know, the oldest is Sweden Restaurant, on Poolsuk Rd serving home style Swedish, European and Thai food to long timers and tourists alike. 18/3 Poolsuk Road. 081 858-8148. Another popular restaurant serving those with a Swedish bent in Hua Hin is Mårtensson’s Taverna, also on Poolsuk Rd, just down from Sweden House. Like most restaurants in Hua Hin, the Taverna offers both European and Thai food. Their Swedish specialities are their Planks, both fish and steak, with large servings of mashed potatoes. The Taverna is very popular for the Christmas Dinner served so if you’re going to be here on Christmas Eve, be sure to book in advance. Poolsuk Rd. 084 655-1351. This site gets lots of hits from folks wanting to know how much food costs in Hua Hin. This is about as easy to respond to as the same question for anywhere in the world so, it varies. However, in an attempt to give folks an idea of food prices in Hua Hin, we’ll start with The Economist’s The Big Mac Index. As you can see, while a Big Mac costs US$3.57 in the United States or US$4.93 in Sweden, the international icon is only US$1.89 in Thailand (actually a Big Mac Set in June 2013 is about 150 Baht and that’s closer to US$5). But, to look at this another way, UBS Wealth Management Research looks at this index and finds that a Big Mac costs 12 working minutes in Chicago, 18 minutes in Copenhagen, and 67 minutes in Bangkok. For what it’s worth, your maid in Hua Hin would probably have to work over 2.5 hours (or 5 hours in reality) for one so there’s more than just taste preference in her opting for noodles or somtom. For another fast food example, the local Pizza Company charges 530 Baht for a Super Supreme Pan Pizza, or about US$18. Your local price may vary. There are local shops that sell steak (beef, pork, or chicken), fries and a small salad for 79 Baht. Others have similar deals with all you can eat buffets for around 169 Baht. I’ll let you imagine the quality of the food, but they are popular. Of course, the Hua Hin Sizzler will charge much more than that for local beef and much, much more for imported beef from the US or Australia and a 5 star hotel will charge much more than Sizzler and add tax and service. These prices are for street stalls or small, open-air restaurants with stools rather than chairs. You’ll obviously pay more for chairs, air con, and ambiance or the number of stars behind the name of your hotel but the price will be much more affordable than the less authentic Thai dish available at your home. This is not to say that all food stalls or restaurants in Hua Hin serve nothing but delicious food. Like everywhere, there are some real posers out there. Suffice it to say, if you see lots of tourists eating in a certain spot, the chances are they serve food for the tourist palate. The same applies if you see many locals eating somewhere. If you see a mixed crowd, that’s probably a sign that they serve all round good food or good value for money, or both. Recently several stylish restaurants have opened, serving dishes not often found in Hua Hin. In some, there always seem to be folks enjoying themselves. In others, there is seldom anyone there. That means something. Should you want to try Vietnamese food, Northern Thai food, or some combination of fusion while you’re in Hua Hin, make sure you see others enjoying the food first. The only thing worse than being the only customer in a large restaurant is being the only customer eating bad food in a large restaurant. Our Scot, Billy, late of Joy Guesthouse, moved from Soi Bintabaht many years ago and now runs Billy’s Bar (for more info), in the Hua Hin Bazaar. Billy and the same staff now offer food all day and drinks ’til late. Billy has sports on the TVs most of the time and sponsors a team in the local pool contest. He’s also known for having very popular rib nights if you like BBQ. Berny’s Inn, at the north end of the Hua Hin Bazaar, is Hua Hin’s 19th Hole. Berny, long out of England via Zaire, is an avid golfer and expert at celebrating the links successes of the day. Berny can also help you with the latest golf news and can recommend the best courses in the area. Berny’s is headquarters of the Hua Hin Golf Society. British pub fare. Soi Bintabaht and adjacent streets have many, many, many beer bars. Some show videos or live sports, some have pool tables and/or darts, some offer pizzas or Thai snacks. The names, owners, and staff change too often for me to keep up or really care. The Hua Hin Brewing Co, at the Hilton, is the up-scale hotel nightclub and disco in Hua Hin. featuring Thai bands doing cover tunes. They also have their own micro brewery. El Murphy’s, off of Bintabaht is another club (with lots of rock ‘n’ roll from their house band) but without the hotel sanitizing. Folks, I would really like some feedback. Years ago, when I first started The Hua Hin Pages, I got a few comments. Now, it's next to never. Please let me know what you like, and what you don't. Give me some ideas on what you'd like to see more of. Just hit the comment icon above and let me know what you think. Thanks.